3. Select Browse and select your Resume or CV from your local machine and then select Upload to complete the process! 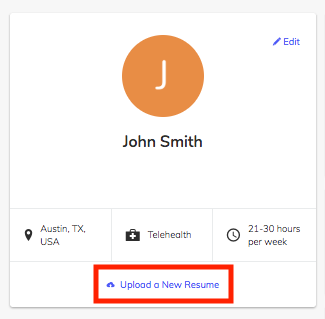 Please note that when you upload a new resume it will be automatically added to any in progress applications. 1. To update your resume, select Upload a New Resume. Congratulations! You've successfully uploaded your resume! If you have any questions at all, reach out to our Support Team!